One of Utah’s “Big 5” national parks, Bryce Canyon is a geologic wonderland and one of the more visited parks in the National Park Service. Its unique limestone hoodoos attracted more than 2.35 million visitors in 2016, and visitor numbers have averaged well into the seven figures for the last decade. Its awe-inspiring formations make Bryce Canyon one of the most geologically interesting parks in the park system. Nevertheless, Bryce Canyon is often overshadowed by the more popular parks to the west. Despite its high visitation, the canyon is sometimes passed up by visitors headed to nearby destinations like Lake Mead National Recreation Area, the Grand Canyon, Zion, and Glen Canyon. While Bryce Canyon does not feature the recreational opportunities at Lake Mead or the geologic spectacle that is the earth’s largest canyon, those who come here will find a slice of the earth’s history to enjoy in greater solitude than might be found at the more highly visited parks. To the visitor go the spoils. Bryce Canyon is the last step on top of Grand Staircase, a stepwise ascent through geologic time that starts at the Grand Canyon, and its geology is unlike any of the other parks below it. Most importantly, Bryce Canyon is not a true canyon. Rather than being formed by flowing water, its hoodoos are created through a repetitive cycle of freezing and thawing called frost wedging. Distinct from pinnacles or spires, hoodoos are so named because their variability in form and thickness is attributed to the differences in the composition of the rock. As occurs more than 200 times per year, winter snow melts during the day, seeping into the rock. Nightly temperatures freeze the water, which expands by nine percent and exerts a force of at least 2,000 pounds per square inch. In time, the soft stone plateaus erode to stone fins, develop “windows,” and eventually decay into freestanding monoliths, hoodoos, which are typically capped by more durable rock, such as dolomite. 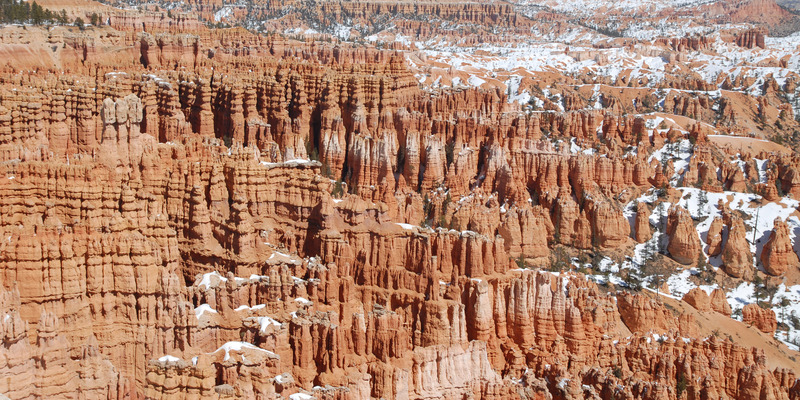 The erosive power of frost wedging has created the thousands of hoodoos that carpet Bryce Canyon. The distinctive hoodoos in Bryce Canyon National Park. Photo by Tyson Gillard. Hikes and overlooks are the best way to enjoy Bryce Canyon and its fascinating geology. Depending on your interest and level of mobility, the park can accommodate hikers of every level. Rainbow Point Overlook: Perched above 9,000 feet at the end of Route 63, Rainbow Point Overlook offers views as far as the Grand Canyon. For hikers, a short 1-mile trail leads to additional overlooks of the canyon and bristlecone pine, the longest-living tree species in the world. Under-the-Rim Trail: A 4-mile trail that leads to the Hat Shop, a series of hoodoos and one of the park’s more interesting geologic features outside of the Bryce Canyon Amphitheater. Note that the return trip is an ascent. Inspiration Point: One of the park’s most popular and scenic viewpoints, Inspiration Point overlooks the Silent City and East Valley. A waypoint on the Rim Trail, it can be combined with nearby Sunset and Bryce points. 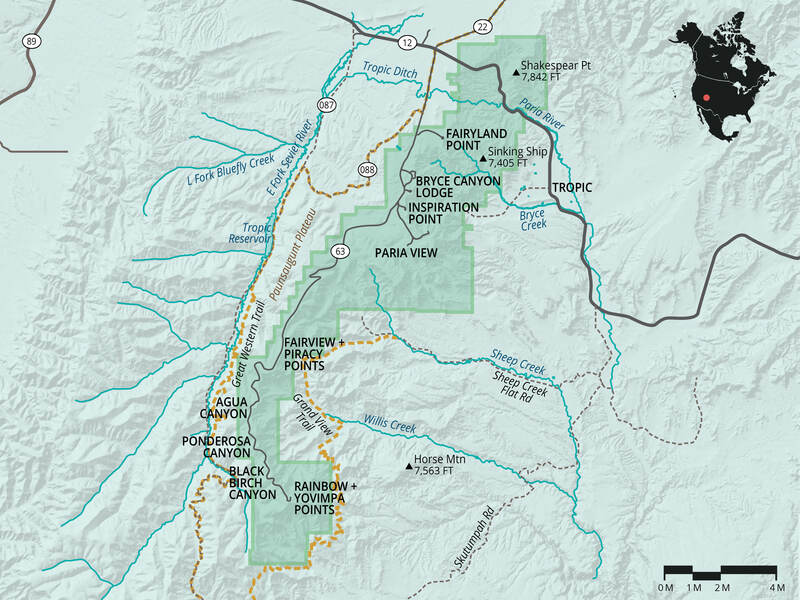 Bryce Canyon Rim Trail: The Rim Trail from Sunset to Bryce points is just 4.4 miles of the trail network that spans the entire rim of Bryce Canyon. Connected with the Under-the-Rim Trail, it spans the entire park from its northern to southern reaches, and it includes the park's most intriguing features. Ambitious hikers: mix and match to your own desire. Numerous backcountry campsites line the trail throughout. Fairyland Loop: One of Bryce Canyon’s longer and more challenging day hikes. It includes a view of the Natural Bridge, an arch formed by running water—a rarity in Bryce Canyon. Sunrise Point: There is no better place to start your day in the park, but be sure to bring some layers for the chilly mornings. Mossy Cave Trail: Another peculiarity in the park, this short 0.8-mile trail parallels Water Canyon to a small shelter cave that, depending on the time of the year, may feature moss-filled overhangs or icicles. Bryce Canyon also features an Annual Geology Festival and an astronomy festival, both of which take place during the summer months. Depending on the season, the park offers guided geology talks, astronomy programs, snowshoe hikes, and kid's programs, all of which enrich the park experience. Given the heavy snowfall during the winter months, Bryce Canyon is a fantastic winter destination. The coat of snow transforms the terrain for a completely unique experience of the park. Fairyland Road and Paria Point Road are left unplowed during the winter for cross-country skiing and snowshoeing. Nor are the trails of Bryce Canyon cleared of snow—the only exception being the paved trail from Sunset to Sunrise points. The upper portion of the Wall Street Slot Canyon is closed in winter. The Peekaboo Loop Connector Trail is often closed due to avalanche potential. Downhill skiing into the canyon is not allowed. Bryce has two campgrounds, North and Sunset, both located near the visitor center. During the busy season, both campgrounds tend to fill up by the afternoon, so be sure to plan ahead in order to secure a campsite. Tent sites cost $20 per night, while RV sites cost $30 per night. North Campground offers 13 RV sites available by reservation and 86 RV and tent sites available on a first-come, first-served basis. Also, the North Campground is within walking distance of a general store, which offers coin-operated laundry and shower facilities in addition to other amenities. One loop remains open during the winter, and North Campground is the only Park Service campground available in Bryce Canyon between October and April. Sunset Campground, in addition to 20 tent-only sites and 80 RV and tent sites, offers a group site available by reservation. Of these, two are wheelchair-accessible, available by reservation through the National Park Service. The Lodge at Bryce Canyon offers rooms late March through late December, and is located near North Campground. Guests can dine either at the lodge's full service restaurant or at the pizzeria and cafe. Wi-Fi is available in the pizzeria and lobby. Pets are not permitted in the lodge. Reservations can be made on the lodge's website or by calling 877-386-4383. If you are looking to stay outside of the national park, additional lodging options including rental homes, B&Bs and hotels are available in the surrounding towns of Bryce, Cannonville, and Hatch. Perched on top of the Paunsagunt Plateau of southwestern Utah, Bryce Canyon sits at 8,000 feet in elevation. As a result of its altitude, the weather can be unpredictable, but some trends persist. In the summer, the park receives most of its precipitation in the form of afternoon thunderstorms, similar to Colorado to the east, with most of these occurring in July and August. Winter, spring, and fall are the most unpredictable seasons. Winters are cold, with temperatures falling below zero and significant amounts of snow for at least seven months out of the year. According to climate data, the best time to visit the park falls in between the winter snows and summer thunderstorms—June and September. Temperatures steady in the 60s and 70s, and precipitation of any form is minimal. Leashed pets are permitted on all paved surfaces in the park: campgrounds, parking lots, paved roads, paved viewpoint areas, on the paved trail between Sunset Point and Sunrise Point, and on the paved Shared Use Path between the park entrance and Inspiration Point. Pets are not permitted on unpaved trails or viewpoints, in public buildings or on public transportation vehicles. These regulations also apply to pets that are carried. Winter is a great time in the park, as the snow provides amazing contrast to the colors of the rock. However, if you are the first on the trail since a storm, you'll be tasked with a pretty tough hike.